I love the size and strategy of this piece! 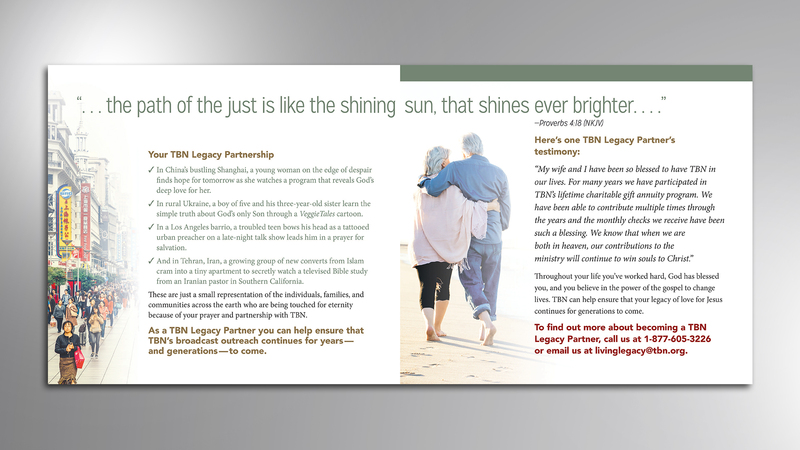 The team at Relay Creative Group did a super job creating the TBN Living Legacy WHY booklet. This simple communication invites potential legacy donors to call or email for more information. 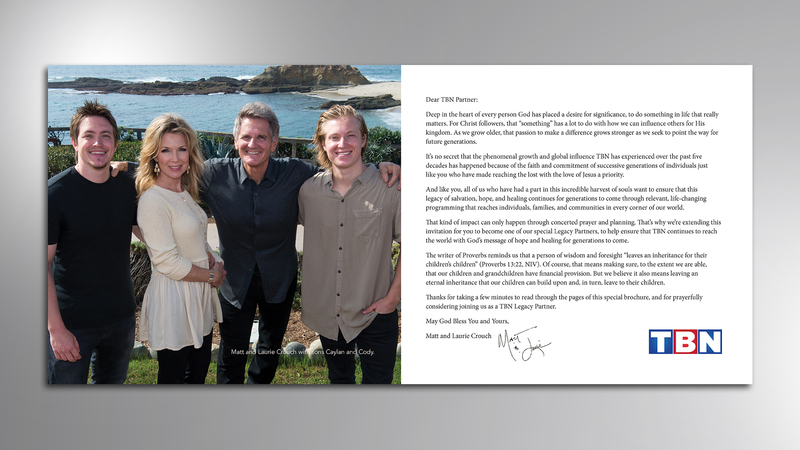 The team has been instrumental in helping TBN Living Legacy. This booklet was refreshing to work on as the size and page design were left open to best read for the target. We used a more open approach with layout, non-cluttered. We also wanted the font sizes to be fairly large as most readers would be 60 and above. The square proportion just feels good! This booklet is the final part in a media kit. This 12-page booklet is positioned in front of 3 other full color brochures that, as a unit, fit down into a pocket folder. We were challenged on this project with branding. After discussing this thoroughly with TBN Living Legacy representatives and executive leaders, we decided to leave the old crest on the very front and the new brand everywhere else on the piece. It was important to note the target we are reaching is connected to the old brand. A compromise we reached, and we are confident traditional donors will still resonate with the comfortability of the older branding on the front.